The Brother HL-4040CN is capable of printing at up to 21 pages per minute in full color, making it a fast, reliable device for all color printing needs. The printer has both respectable resolution settings and PCL 6 emulation, along with an impressive list of performance specifications. A4 paper can be printed to with a speed of 20 pages per minute for both black and white and color, while other compatible media types include legal size and special paper. 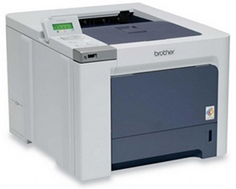 Ethernet capability is included with the Brother HL-4040CN which is excellent for small groups who have little color printing needs, but could occasionally benefit from a shared unit. Print resolution runs at 2400 x 600 dots per inch in both color and monochrome, which is great for creating full color, full page imagery and pamphlets, or just keeping standard text looking sharper than usual. Direct printing, straight from a digital camera, is even possible thanks to PictBridge technology. A front loading, direct print USB port allows for the interface with any PictBridge compatible external device, though there is no dedicated LCD screen for previewing, only a simple status LCD. A certain degree of fonts are included with the unit such as scalable, bitmapped, and barcode fonts, all made possible by PCL 6 emulation. The unit has a maximum monthly duty cycle of 35,000 pages which means that it is more than capable of printing large quantities, though the 4 included toner cartridges and printhead won't last long under heavy office printing conditions. The unit is fairly large, with dimensions of 16.5 in. x 18.7 in. x 12.5 in. (W x D x H) and a solid curb weight of 64 pounds. Even for a color laser printer, which usually run on the heavy side, this device takes up enough space in the world to potentially become obnoxious. Paper handling abilities, though decent, could be a little higher for such an expensive and large unit. 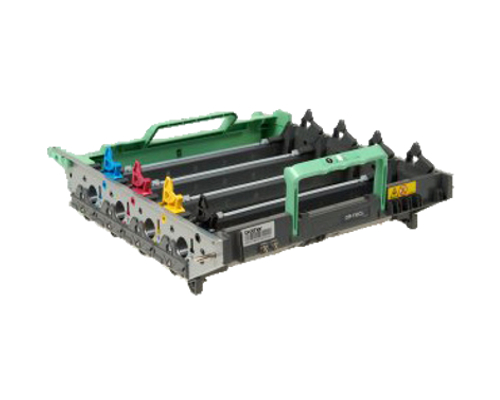 A 250 sheet standard input tray which can be used for letter, legal, and A4 sized paper, along with a 50 sheet multipurpose tray, give the Brother HL-4040CN a total of 300 sheets of storage. The processor included is also just not quite up to par with a speed of 300 MHz. The fact that memory cannot be expanded is unacceptable, though the included 64 MBs is decent enough for most print applications, and utilizes SODIMM technology. First print out times are flat out bad, with black and white being at 16 seconds and color at 17 seconds, one can expect to wait a considerable amount of time for their workloads to spool up initially. 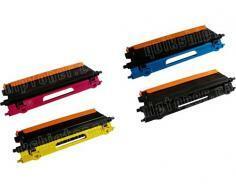 Review it: "Brother HL-4040CDN "
Each Brother HL-4040CN printer requires four different color toner cartridges to operate, which include black, cyan, magenta, and yellow. While the black cartridges for this particular printer carry a 5,000 page yield at 5% coverage, the color devices provide only 4,000 pages each, which is still an amount that could be considered more than acceptable.